A SOCIAL worker fears she may be forced to leave her Haverhill home if plans to convert the neighbouring properties into a home for a housing group go ahead. Lynne Brixius, who lives in the remaining flat at the former St Mary's Church Hall in Camps Road, says parking provision in the area is already abysmal and the building, which is over 100 years old, is too small to accommodate another eight people. St Matthew Housing has applied to St Edmundsbury Borough Council to convert two of the three self-contained flats to form a seven-bedroom group home. The group has run The Limes, close by in Camps Road for the past 10 years, catering for nine homeless people. Mrs Brixius said: "I think it is totally inappropriate. "It will completely destroy the character of the building and be extremely overcrowded. "With that many people there is bound to be some noise and I am only a brick away. I don't want to move, but I feel I will have to, although my property will be worth next to nothing," she said. Sara Hinton, regional officer for St Matthew Housing, said they wanted to establish the home to meet demand for places. Residents there would be more independent than those at The Limes in an effort to help them back into mainstream housing. Ms Hinton said she understood the neighbour was reasonably happy about the plan, and efforts would be made to make sure the conversion was designed to disturb her as little as possible. "We have a strong ethos for residents to get on with our neighbours and we have a good track record for doing so," Ms Hinton said. 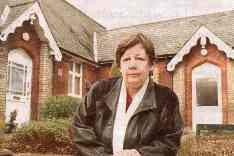 CAPTION: Worried... Lynne Brixus, who fears the plan to house homeless people next to her flat in the former St Mary's Church Hall would overcrowd the building and destroy its character.